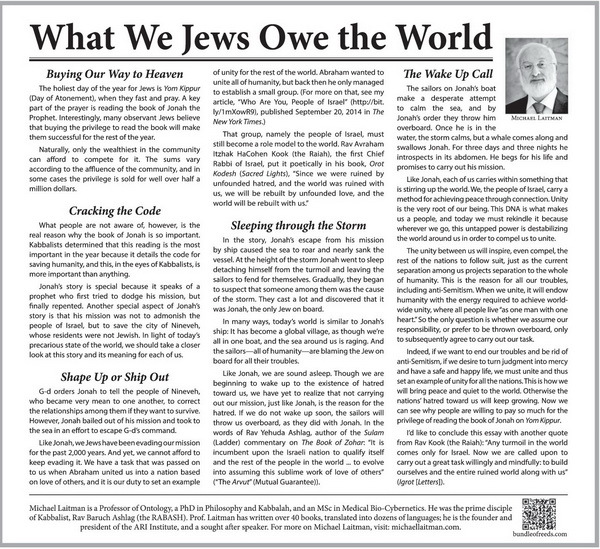 I received numerous comments by email to my The New York Times articles, “Who Are You, People of Israel?” and the latest one “What We Jews Owe the World.” I am delighted that these articles touched so many of you and will do my best to reply to all of you. Please leave your comments and thoughts here and I will be more than happy to reply to all of them. The holiest day of the year for Jews is Yom Kippur (Day of Atonement), when they fast and pray. A key part of the prayer is reading the book of Jonah the Prophet. Interestingly, many observant Jews believe that buying the privilege to read the book will make them successful for the rest of the year. Naturally, only the wealthiest in the community can afford to compete for it. The sums vary according to the affluence of the community, and in some cases the privilege is sold for well over half a million dollars. What people are not aware of, however, is the real reason why the book of Jonah is so important. Kabbalists determined that this reading is the most important in the year because it details the code for saving humanity, and this, in the eyes of Kabbalists, is more important than anything. Jonah’s story is special because it speaks of a prophet who first tried to dodge his mission, but finally repented. Another special aspect of Jonah’s story is that his mission was not to admonish the people of Israel, but to save the city of Nineveh, whose residents were not Jewish. In light of today’s precarious state of the world, we should take a closer look at this story and its meaning for each of us. G-d orders Jonah to tell the people of Nineveh, who became very mean to one another, to correct the relationships among them if they want to survive. However, Jonah bailed out of his mission and took to the sea in an effort to escape G-d’s command. In the story, Jonah’s escape from his mission by ship caused the sea to roar and nearly sank the vessel. At the height of the storm Jonah went to sleep detaching himself from the turmoil and leaving the sailors to fend for themselves. Gradually, they began to suspect that someone among them was the cause of the storm. They cast a lot and discovered that it was Jonah, the only Jew on board. In many ways, today’s world is similar to Jonah’s ship: It has become a global village, as though we’re all in one boat, and the sea around us is raging. And the sailors—all of humanity—are blaming the Jew on board for all their troubles. Like Jonah, we are sound asleep. Though we are beginning to wake up to the existence of hatred toward us, we have yet to realize that not carrying out our mission, just like Jonah, is the reason for the hatred. If we do not wake up soon, the sailors will throw us overboard, as they did with Jonah. In the words of Rav Yehuda Ashlag, author of the Sulam (Ladder) commentary on The Book of Zohar: “It is incumbent upon the Israeli nation to qualify itself and the rest of the people in the world … to evolve into assuming this sublime work of love of others” (“The Arvut” (Mutual Guarantee)). The sailors on Jonah’s boat make a desperate attempt to calm the sea, and by Jonah’s order they throw him overboard. Once he is in the water, the storm calms, but a whale comes along and swallows Jonah. For three days and three nights he introspects in its abdomen. He begs for his life and promises to carry out his mission. Like Jonah, each of us carries within something that is stirring up the world. We, the people of Israel, carry a method for achieving peace through connection. Unity is the very root of our being. This DNA is what makes us a people, and today we must rekindle it because wherever we go, this untapped power is destabilizing the world around us in order to compel us to unite. The unity between us will inspire, even compel, the rest of the nations to follow suit, just as the current separation among us projects separation to the whole of humanity. This is the reason for all our troubles, including anti-Semitism. When we unite, it will endow humanity with the energy required to achieve worldwide unity, where all people live “as one man with one heart.” So the only question is whether we assume our responsibility, or prefer to be thrown overboard, only to subsequently agree to carry out our task. Indeed, if we want to end our troubles and be rid of anti-Semitism, if we desire to turn judgment into mercy and have a safe and happy life, we must unite and thus set an example of unity for all the nations. This is how we will bring peace and quiet to the world. Otherwise the nations’ hatred toward us will keep growing. Now we can see why people are willing to pay so much for the privilege of reading the book of Jonah on Yom Kippur. I’d like to conclude this essay with another quote from Rav Kook (the Raiah): “Any turmoil in the world comes only for Israel. Now we are called upon to carry out a great task willingly and mindfully: to build ourselves and the entire ruined world along with us” (Igrot [Letters]). Michael Laitman is a Professor of Ontology, a PhD in Philosophy and Kabbalah, and an MSc in Medical Bio-Cybernetics. He was the prime disciple of Kabbalist, Rav Baruch Ashlag (the RABASH). Prof. Laitman has written over 40 books, translated into dozens of languages, and is a sought after speaker. For more on Michael Laitman, visit: michaellaitman.com.